Google has always released services that are useful to better understand major events: new imagery that shows the impact of Hurricane Katrina, special search engines for last year's earthquake in China, search trends for 9/11. Google Translate included an early version of a translation system for Persian, in response to the recent events from Iran. "We feel that launching Persian is particularly important now, given ongoing events in Iran. Like YouTube and other services, Google Translate is one more tool that Persian speakers can use to communicate directly to the world, and vice versa — increasing everyone's access to information," says Franz Och, from Google. The translation tool can also be used to read articles from Iranian sites, but the quality is less than adequate. For example, here's the translation of the latest 50 Twitter messages tagged #Iran and written in Persian (Farsi). That's amazing! 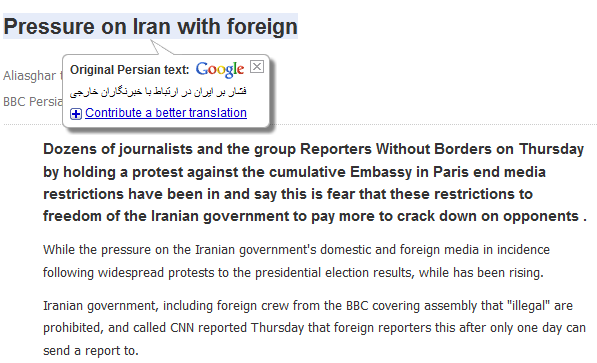 I copy pasted Persian text from twitter to Google translate last night, and it wasn't yet supported! Thanks for supporting Persian, it has many problem but for alpha version is good, and specially at this time the majority of people need it. Thank you my dear Google! I thought Google forget us, but now I just say thanks Google. امیدوارم به دلایل سیاسی این کارو نکرده باشه . تشکر از گوگل به خاطر خدمات عالی شان. I love Google,life without google is so hard for me , thank you, thank you ,thank you . What is the error when the animation producer of Naruto, "Naoji Hohnokidani" became translated to "No sealing east"? In other languages e.g. Russian, it translates such names 岸本征史 (Masashi Kishimoto) translated to Масаси Кисимото, 西尾哲也 (Tetsuya Nishio) as Нисио Тэцуя etc. The biggest problem I have with Google is that when I save an email to read later I am unable to open it. It is all scrambled or NA, or has been deleted by Google?